Ay-Chung Flour-Rice Noodle (阿宗麵線) in Taipei’s Ximending neighborhood is hard to miss. You can always tell which places are popular by the number of people waiting outside. Just look for the long line and crowds of people standing around in the street with bowls of flour rice noodles. The restaurant, more of a street stall in a building, seemed to be busy at all hours of the day. 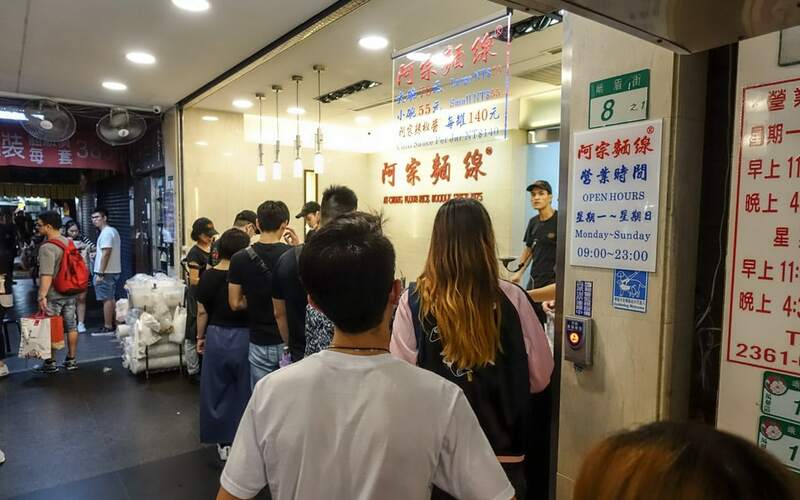 From opening to closing, both locals and tourists flocked here for the cheap and filling bowls of rice flour noodles. I don’t think you could find a simpler menu than the one at Ay-Chung Flour-Rice Noodle. If you are one of those people that can never decide what to order at a restaurant, like me, you don’t have to worry. There were two options: a small bowl (55 TWD or about $1.85) or a large bowl (70 TWD or about $2.53) of noodles. 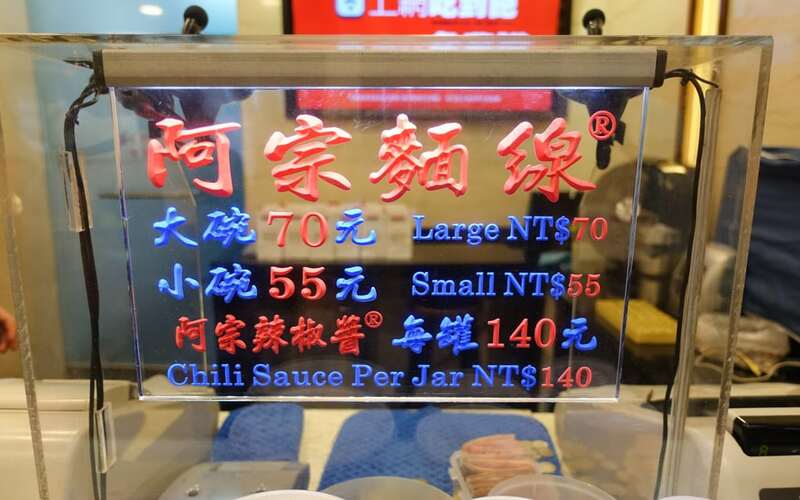 In addition, for 140 TWD or about $4.73, you could take home your own bottle of chili sauce. When I arrived at Ay-Chung Flour-Rice Noodle, I was somewhat confused where to stand or how to order. There were people everywhere. Some in line, a few loading up on condiments, and everyone else was standing around eating. I decided to join the long line that extended out from the restaurant into the street. Turns out I was in the right place. After a few minutes, I reached the front where I handed my money to the cashier. From the cashier, the line continued to the left. 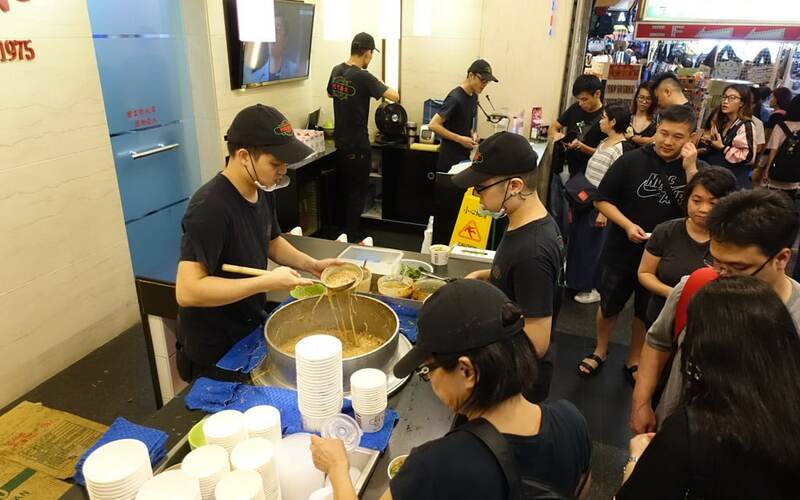 Standing over a large steaming pot was a worker who was scooping bowl after bowl of rice noodles and handing them to hungry customers. 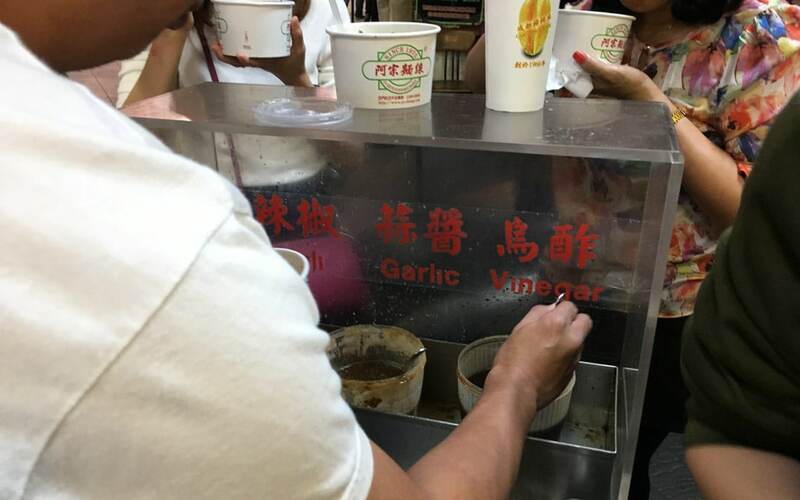 After getting your bowl, you can stop by the small station to add any combination of chili oil, puréed garlic, and vinegar to your soup. I enjoyed how the vinegar added a nice acidic component to the dish. Since I was working my way through Ximending trying as many foods as possible, I settled for a small bowl of Flour Rice Noodles (55 TWD or about $1.85). The bowl might have seemed small but it was packed with a generous amount of rice noodles, pig intestines, and cilantro in a steaming hot broth. The thick golden brown broth was the star of the dish. It was rich, salty, and smokey with a rather strong dashi flavor. Each bite had delicious flavors of the ocean. Floating in the broth was a generous amount of rice noodles that almost melted into the broth. The noodles were silky and tender without much texture. Though thin, the noodles soaked up the salty seafood flavors of the broth. I’ve never been much of a fan of tripe so I was surprised by just how much I enjoyed the pig intestines floating in the soup. Each piece of the oily meat was an interesting mix of chewy and tender bits. Some pieces were tougher than others. I enjoyed the chewy texture which complemented the soft noodles. The flavor of the pork was slightly gamey without being too intense. Topping off the bowl of rice noodles was fresh, aromatic cilantro. Everything seems to taste better with cilantro. The herby flavors complemented the taste of the intestines and strong salty broth. Wait in line, pay, and pick up bowl. Not much else to it. I was surprised by the number of food options while wandering around Ximending. 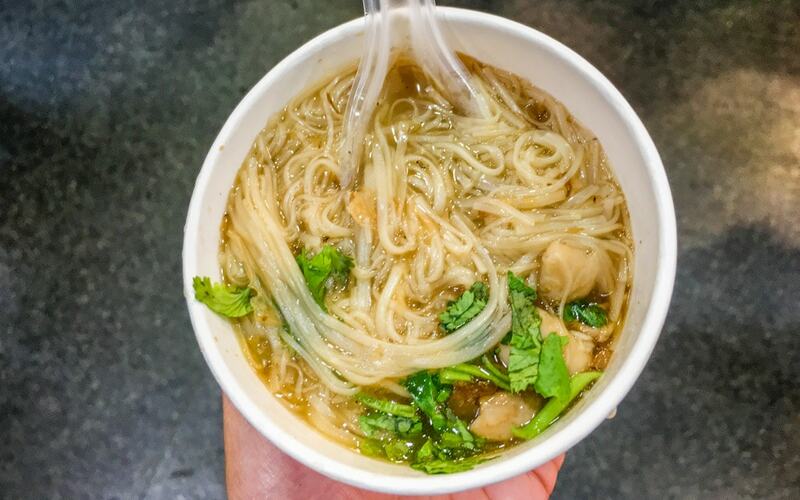 In an endless sea of street food stalls and restaurants in the area, Ay-Chung Flour-Rice Noodle stands at the top. There might not have been any tables or places to sit, but I wouldn’t have had it any other way. It doesn’t get better than eating a delicious bowl of rice noodles with a hundred other people in the streets of Taipei.